RECEIVING a subtle feed from skipper Balut Doctora on the counterattack, Daniel Matsunaga didn’t take long to gather himself and get into position before calmly slotting home the third goal in Stallion-Sta. Lucia’s 4-0 victory over PSG in the United Football League. Just like that, the Brazilian-Japanese celebrity showed he's more than just a pretty face in the top flight. That one goal gave the 24-year-old model/actor's fans, especially female, something more to cheer and scream about on Valentine’s Day other than his good looks and buff physique - and provided further proof that he is more than an ornament in the country's premier football league. Born in Brazil where 'The Beautiful Game' is a religion, Matsunaga has been playing football since he was five and moved to the country a few years ago not only for showbiz but also to continue playing the sport he loves. 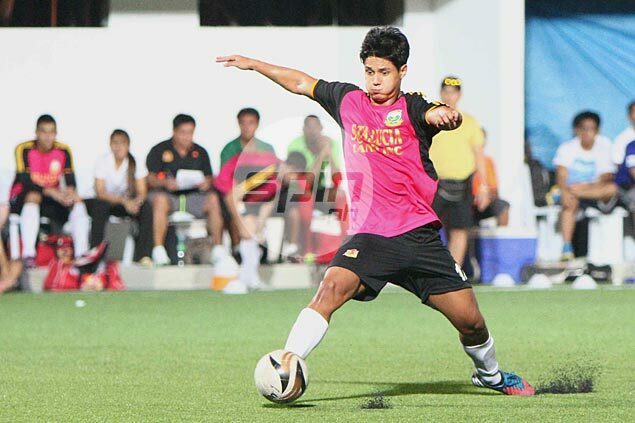 “I decided to play here (in the UFL) to maintain my body fitness,” the 6-foot-1 Matsunaga said. “I love to maintain a healthy lifestyle and I love sports and this is the main sport for me. Matsunaga played in Division 2 last season for Socceroo, where, by his own count, he scored six goals. After a short, uneventful stint with newly promoted Pachanga in the last Cup wars, Matsunaga tried out for other teams and ended up with the reigning UFL Cup champions. “They invited me to play for the team and luckily I was well received by the coach,” said Matsunaga, one of three celebrity newcomers in the Stallions aside from Fabio Ide and Andrew Wolff. The attacking midfielder was immediately given the chance to play for his new squad as Nierras inserted him in the last 15 minutes in the Stallions’ 3-1 opening win over Green Archers United two weeks ago. Despite getting only a few touches - and having little impact - on his debut game, Matsunaga was given more playing time in their next game against PSG, coming in for Prince Boley in the 73rd minute. Matsunaga repaid his coach’s faith with his right-footed effort from the right flank off a nice setup by Doctora. “It’s a great feeling. I’ve been training a lot and it’s been a lot of hard work,” said Matsunaga, who wakes up at 5 a.m. to make it from his Makati house in time for the 6 a.m. Stallion practice at Bonifacio Global City, Taguig.